Print quality and resolution - Dpi (Dots Per Inch) - The higher, the better. There are special terms used for defining the print quality of dot matrix printers: Draft - the lowest print quality, NLQ - Near Letter Quality, LQ - Letter Quality. Besides the resolution, you can also set up the print quality (better, middle, best, economy mode). Higher resolution is usually reached by help of SW settings. Print speed - measured in ppm (pages per minute) - it differs, depending on used print technology, document size and type, memory installed in the printer and computer speed (in case of images). The speed of dot matrix printers is usually measured in impacts per second. Presented value can be result of testing upon different conditions and with different amount of graphic elements contained on a page. So, these data presented by the manufacturers must be taken "with a pinch of salt". The higher print quality you set up, the lower speed of printing color documents and photos you will get. Colors - at present, the widest spread printers are the color ink ones. Dot matrix printers only use one- or three-color ribbon. Common laser printers only use black toner. Color laser printers reach a very high quality, but are relatively expensive. Older inkjet printers could not print in colors. Noisiness - dot matrix printers are the noisiest ones, followed by inkjet printers. Laser printers are the quietest printers. The noisiness is measured in db. Print format - Maximum paper size that can be used in printers - typically A4 or A3. It is important to take into account that not all printers are able to print completely filled page in its whole largeness including margins or headers. So, the real printable area is the format you use minus 5 - 20mm of margins. Processor - the processor inside the printer helps to speed up processing of print tasks. Printer load (Duty Cycle) - number of pages per month. The more expensive printer, the higher amount of pages per month it can print. Even if this value is a recommended value, you should not exceed it. In case you do so, possible complaint may not be accepted if some service work is needed. Laser printers are designed to be most heavily loaded. Feeder capacity - number of pages A4 or other formats that can be put into the feeder at once. Typically about 20-50, in high-capacity ones it is from 100 to 1000. Recommended load - the service life of a printer is a very important piece of information, sometime hidden in presumed monthly load (printer reliability). In general, the printers intended for office use should be chosen carefully - they should have longer service life, which is achieved thanks high quality components built inside. Generally, the service life is measured in hours, but in case of printers it is rather measured in presumed load per month (typical value is from 500 to 5 000 and more pages per month. If the recommended load is higher and service life shorter, you can expect higher service costs and so higher print costs, as well (the money you save when buying the printer you spend for service). Service life - measured in hours (MTBF), combining with recommended load. Buffer memory - is very important for frequent printing and printing of graphics. Size of this memory ranges from 1MB to 16MB and more. In some printers, standard SIMM or DIMM are used. In most printers, this memory can only be extended with special but expensive memories. Print costs - depend on used print technology, set up quality and type of printed pages. It is suitable to include the price you paid for the printer and price for the consumable supplies in the final print costs. Print costs increase with higher resolution, color print and when printing graphics. Printing on dot matrix printers is the cheapest, laser print brings a bit higher costs, inkjet print is the most expensive. When printing photos and using special paper, the price increases rapidly (especially thanks special type of paper which is very expensive). The price presented by manufacturers is usually the a price for a page covered with colors on 5% of its whole area. Warranty - 1 year warranty is a standard, for an extension you have to pay an extra charge. E. g. HP provides a 3-year extension for a charge. Service - About the service you can learn more in the shop where you bought your printer. Where the service centers are available, you can learn on sites of particular manufacturers. In general, branded service works or replacement of an essential part (e. g. some electronic part) can be more expensive than a new printer. GDI (Graphical Device Interface) - a Windows standard. 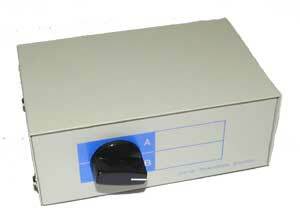 It has been designed to transfer graphic images to printers and monitors. This is used for printers that do not have nor processor neither memory. Documents are processed in computer which sends the document into the printer as a print image of the document. A great disadvantage of this is slower print and higher requirements on computer performance. The only OS which support this is Windows, printing under OS DOS is not available. Its great advantage is low price and quality print. Postscript - printer control language used in professional printers. In combination with a powerful print processor and large memory, the printer is able to process and print a very complex document containing a lot of graphic elements within several seconds. Serial connection (COM) - you can se very rarely. Very slow data transfer. Parallel connection (LPT, Centronics and Bitronics) - most frequently used connection. Fast connection, fast data transfer. In more recent printers, this has been replaced by USB interface. Some printers can have several LPT ports, then they are marked as LPT1, LPT2,... 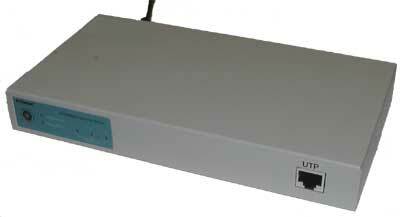 The LPT port can also be assigned to a network printer, if needed for DOS programs. USB - connection being used recently. 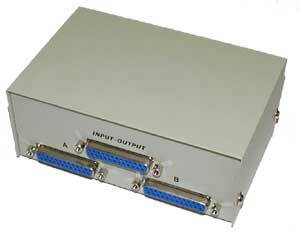 Several times faster data transfer than through the parallel port. The length of the USB cable can become a problem here, because it is shorter than the cable for parallel connection (max 5m versus 2 - 10m). IrDA - Infrared transfer. Used for NTB and other portable devices. Its advantage is the absence of cables. IEE1394 (Firewire) - is not usually used for printers, however, it may be also used in printers in the future. Network - connection through a network card or network interface (e. g. JetDirect) integrated directly in printer. High data transfer rate. Designed for large networks and large amount of users. Data switches for printers - a little box which, according to its design, can contain one or two input ports from computer and from one up to 4 ports for connection of printers. Manual or automatic connection. -Print server - it can be a computer with one or more ports with connected printers which can be used by other users through an operating system. Print servers can also be electronic devices containing RJ45 connector for computer network and several parallel ports for connection of printers. Support software on one of the computers provides the configuration and access to chosen printer. This solution is recommended for creating of printer pool. To be able to print under DOS, the drivers are needed only for some programs. In Windows 9x/NT/2000 some drivers are part of the system, but mostly it is recommended that you use drivers from the installation disks or that you download them from Internet. Paper weight - weight of paper on a square meter. Classical office paper usually has about 80g/m2. It is specified what maximum paper weight you can use on your printer. If you exceed it (thick paper), the paper can get stuck inside the printer and damage it. Formats - there exist various paper sizes. A4 is a standard. Most printers can print on A4 and lesser formats, exceptionally on A3. A2 and larger formats are printed on large-format printers or plotters. Surface - paper that is used for printing photos and graphics has a special surfacing. Such paper is mostly designed for inkjet printers and usually differ from the classical paper in its thickness and glossy surface. Self-sticking labels - designed for printing on envelopes and goods. There exist different sizes and types of labels on fanfold paper or individual sheets. Films - used in opaque projectors. In order to get the right image from the projector, the picture must be sometimes printed as a mirror image. Iron-on paper - to transfer pictures and texts onto textile fabrics. Mirror image is needed. Fanfold paper - its advantage is that you get several copies with one printed page and that you can print longer lists - this kind of paper is very cheap, but mostly is determined to be used in dot matrix high-speed printers. Ideal for printing data from bookkeeping programs, invoices, receipts and inventory lists. Fanfold paper can have different width and different amount of copies (such paper with 3 sheets can be marked e. g. 25" 2+1 - 25" means its width). Printer does not print under Windows - this usually means the printer has not been installed at all, or has not been installed and configured properly. Or, the printer may be turned off, cable is wrong, there can be some HW error or the user has omitted something important. Printer is offline - the printer is turned off or set up as offline. In case this problem appears on a network printer, the computer which the printer is connected to may be turned off. Such problems can also be caused by wrong drivers, cables, ports or the printer itself. Cables - The cable is not plugged in correctly or is pulled out. Wrong cable. Avoid older cables that are designed only for one-way communication (only 18 wires are connected - cannot be recognized without disassembling the connector). 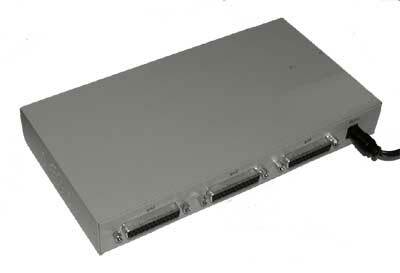 Port - Wrong port or cable leading to the port (older computers with AT motherboards). Some older printers cannot work with new computers with set up ECP and EPP modes. Drivers- more than a half of the problems with printing are caused by drivers. Feeder - the feeder is probably the most questionable part of the printer. It can happen that several sheets of paper are loaded at once which results in jamming the printer or its damage. Solution: cleaning of the printer or changing some parts of the feeder. It is normal in some printers that they sometimes load several sheets at once. It also depends on the paper type. Stuck and jammed paper - problem with feeder, paper type or some part of the printer. Fuzzy print - wrong paper, problems with consumable and being worn parts of the printer (heads, ink and toner..) or with the printer itself. If this happens on an inkjet printer, the nozzles may be dirty. It is suitable to use the self-cleaning function of the printer (printer´s control panel or software supplied with the printer). Uneven print and white vertical lines - Dirty print heads or there is not enough ink in inkjet printer or toner in laser printer. If the toner is not completely empty, you can solve the problem for a short time by shaking it. In case the problem remains also in case the cartridges has been changed, the problem can be caused by the printer itself. Colors can be easily removed from the paper - if you have an inkjet printer, you must wait a little while till the ink gets dry. You should also use the correct paper type. 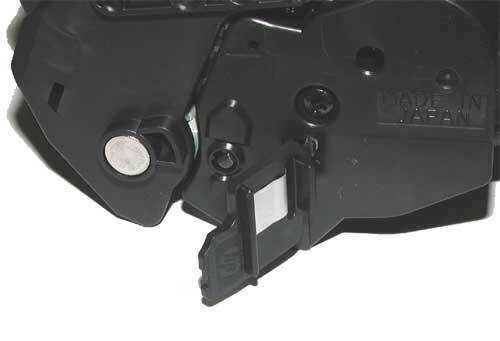 If you have a laser printer, you may have problems with fuser mechanism. Printed document is not complete - not enough memory in the printer or in computer, problems with drivers or the printer itself. Meaningless characters - Wrong driver. Print is too slow - complex processing and printing of graphic elements can take up to several minutes. Printer testing - a test page is used for testing. There exist two types of such pages: 1. Page is printed from printer setup program in Windows - checks the communication between printer, correctly installed driver and the printer. 2. Page is printed directly from the printer by help of pressing combination of keys - checks the printer itself. Paper stuck inside - here, you have to find out which way is the best to get inside the printer and how to remove the stuck paper. Most printers have several ways into inside. You may have to take out the toner or some parts of the printer to get in. Sometimes a "gross" force is needed. But be careful - you may damage the printer! Replacing cartridges - can differ, depending on the manufacturer and printer type, detailed information about how to correctly replace the cartridges you will find in the manual supplied with the printer. In 90% of cases no professional help is needed. Before you put the cartridges into the printer, remove protective elements (protective vinyl tapes on nozzles in inkjet printers; toners contain similar tape that must be also removed). Some HP printers are being equipped with digital camera cards readers recently. Advantage of these readers is fast print of photos without the necessity of having a computer.